The scene is a parody of the play Hiragana seisuiki, which is related to the legend of the bell of the Temple of Mukenzan. According to the legend, the tolling of the temple bell generates wealth in this world, and the pangs of hell in the after world. 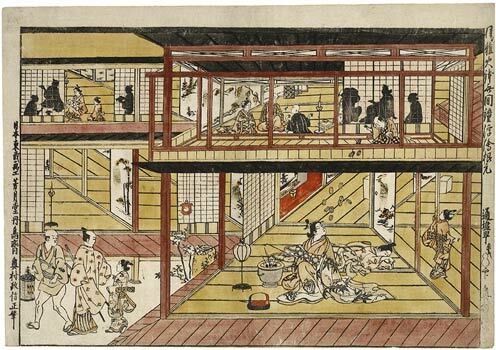 In the picture, a prostitute on the ground floor is striking a hibachi with her pipe, this prompts a joker to throw gold coins down from the floor above. In a brothel, the evening’s business is underway. A young Samurai, Kajiwara Genda Kagesuye, with two swords in his belt, and wearing a haori decorated with plum blossoms, is standing in front of the house accompanied by a little kamuro and a servant wearing the sign for “happiness” on his sleeves. The servant is holding a lantern with the mon of Kajiwara Kagesue in the form of two arrow tails. The sign “happiness” (kotobuki) appears again on the hanging scroll in the tokonoma of the ground floor. On the upper storey the courtesans are entertaining their guests in various rooms. On the lower floor a courtesan lies asleep. But her colleague is still awake. She strikes a bronze hibachi (brazier) with a long pipe. At this, golden ryô pieces suddenly rain down from the upper floor. A man has heard the banging and is throwing gold pieces down to her. This story alludes to a folk tradition from the Tôtomi province. He who strikes the bell (kane) of the Kannon temple of Muken-zan (to the south of Shizuoka near Sayo-no-Nakayama) will be blessed with riches in this world. But in his next existence he will be thrown into a “Hell of Eternal Tortures” (muken jigoku) (skr. avici). This is the worst hell, in which beings endure boundless suffering without end. This legend has inspired various theatrical plays. Usually the lovers, wife, or parents sacrifice their own future bliss in order to save their lover or their own children. In 1698, the première in Ôsaka of such a muken-no-kane play took place. The onnagata Segawa, Kikunojô produced a dance version (shosagoto) in Kyôto in 1728, in which he replaced the bell with a washtub provided with a scoop. In the play Keisei fukubiki Nagoya, Kikunojô made use of the variation he had invented when playing the courtesan Katsuragi, who beat the wash tub on behalf of her lover Nagoya, Sanyo, producing a rain of gold coins. In the version of the theme depicted here, the courtesan Umegae bangs on a bronze brazier producing golden rain. She wants to help her lover Kajiwara Genda Kagesue to get his armour back from the pawn-broker’s. He had spent all his money on her and finally pawned his armour as well. But Minamoto-no-Yoritomo called him to arms. In the battle of Ikuta, he fought with a blossoming plum branch in his quiver in her memory. He fell in the year 1200 together with his father Kagetoki. Our version of this theme is set, however, in the 18th c. The courtesan’s name, Umegae, is the title of a Nô play, in which neither a pot nor a bell are beaten but a drum. Further impressions of the leaf discussed here are to be found in Berlin and Chicago. Uki-e (perspective pictures) were most probably invented by the artistic genius Masanobu. Masanobu was reacting here to European perspective. Many of the uki-e appear agitated and crowded as a result of the number of figures and the complex arrangement of the rooms. But the emphasizing of the parallel lines of the architecture in alternating directions lends to this woodblock a cool calm. The shadows of the figures behind the shôji (sliding doors) provide interesting accents, which in turn are framed by the wide black lines of the roof. Thus the upper area is strongly stressed. One discovers the lady protagonist of the print on the ground level only at second glance.